I've had a really nice stretch in the studio... been able to create a lot of music this past year. Here's what's coming (as always--Lord willing)..
My cover of "You're a mean one Mr. Grinch"
The follow-up to my first parody project "Storm The Gates"
I have over a dozen songs recorded... not sure what the final track count will be just yet. SONGS RECORDED SO FAR: Hightway 2 Heaven (AC/DC - Highway to hell) ... Obey You Commands (Styx - Too Much time...) ... Savior from Heaven (Led Zep. Stairway to heaven) ... We will fight ( Black Sabbath - Neon Knights) ... Help Me Jesus (38 Special - Hold on Loosely) ... Lift Him Up (KISS - Lick it up) ... Orchestra of Revolution (Megadeth - Symphony of destruction) ... Songs to be added: So Grateful You Love Me (Night Ranger - Don't tell me...) ... He did His father's will (Motley Crue - Looks that kill) ... Never Doubt You (Scorpions - Can't live without you). So much great music to share -- so little time! Stay tuned and keep looking up! SAGA -- Life is hard - God is good! SAGE is track 12 from my 2004 80s Christian Rock / Metal release, “Out Of The Hellhole.” SAGA is an onslaught of 80s influenced Christian Metal encouragement! It’s a full-frontal-assault of hard-rock spiritual edification and challenge. Life is a SAGA—filled with ups and downs. As Christ-followers we KNOW that we NEVER walk through a single moment of life ALONE. Jesus is ALWAYS with us. And anything He leads us TO He will lead us THROUGH. No Turning Back - Following Jesus! NO TURNING BACK is track 9 from my 2004 80s Christian Rock / Metal release, “Out Of The Hellhole.” Do you remember the old hymn, “I Have Decided To Follow Jesus,” by S. Sundar Singh? NO TURNING BACK is an 80s style-Christian-hard-rock/metal style reinvention of that classic song of the church. I hope it totally Rocks You Up for Jesus! Donald Trump, Hillary Clinton & Stryper! LOVE IT! 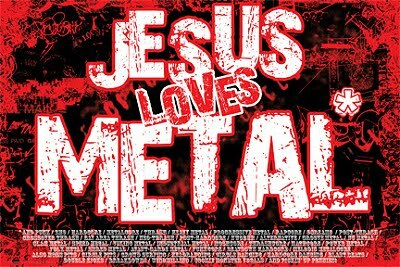 80s Christian Metal Rules! John Cusack - Say Anything, Jon Hooper, Pastor Brad & Instrumental Metal for Jesus! This song brings a lot of fun elements together--John Cusack, with a line from one of my favorite 80s movies, Say Anything... Some smokin' licks by the very talented Canadian Shredder, Jon Hooper and some humble addtions by Yours Truly -- on this instrumental metal song -- that was inspired while I was working on "modes" on the guitar... I discovered a scale that sounded very "arabian" -- alas - "Arabian Nights." Enjoy!